AzhwAr, remembering emperumAn’s act of measuring the worlds, thinks that he is standing, sitting, lying in various divine abodes in kAnchIpuram, probably due to the fatigue that he had while carrying out that activity and gets fearful. Since the purpose of his dwelling [in various divine abodes] is only for the sake of others, he tells his heart to desire to see him. anRu ivvulagam aLandha asaivE kol – is it the fatigue of leaping onto the skies and measuring the worlds, in standing posture, when the worlds did not even think of [asking for the help]! nINagar vAy anRu kidandhAnai – one who took a reclining posture in the huge town of thiruvehkA. He stood up to measure the worlds. Since the divine feet were hurting, he sat (in the abode thiruvELukkai). Since even sitting was hurting, he reclined (in thiruvehkA). kEdil sIrAnai – one who has auspicious qualities forever. mun kanjaik kadandhAnai – one who removed the enmity which came from kamsa, once upon a time. 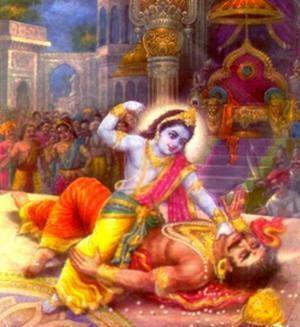 One who caused harm to kamsa and killed him when kamsa thought of harming and killing him. nenjamE kAN – Oh heart! Will you not think [of these activities]? Why are you thinking of other activities instead of meditating on these? Is it proper not to meditate on emperumAn who is transforming himself for our sake and carrying out such activities? AzhwAr tells his heart to think of emperumAn who is sitting at thiruvELukkai and reclining at thiruvehKa, probably due to the tiredness of measuring all the worlds. We will move on to the 35th pAsuram next. This entry was posted in iyaRpA, mUnRAm thiruvandhAdhi on April 1, 2018 by T N Krishnan.